Organohalogens - indicators of extraterrestrial life? 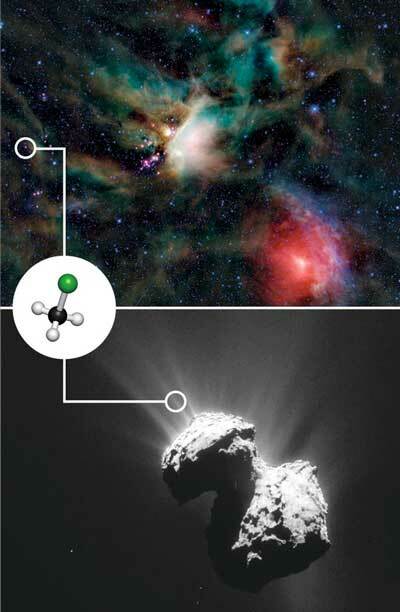 (Nanowerk News) Using data captured by te Atacama Large Millimeter/submillimeter Array (ALMA) ALMA in Chile and the ROSINA instrument on ESA’s Rosetta mission, an international team of astronomers including scientists from Harvard University, the University of Cologne, the University of Copenhagen in Denmark, and others, has found faint traces of the chemical compound Freon-40 (CH3Cl), an organohalogen, around both an infant star and a comet in our solar system. This is the first detection ever of a saturated organohalogen in interstellar space. This result has now been published in the journal Nature Astronomy ("Protostellar and Cometary Detections of Organohalogens"). Freon-40 is formed by organic processes on Earth, so it has been considered as a marker of extraterrestrial life. But since this is the first ever detection of a saturated organohalogen in interstellar space, it may not be as good marker of life as had been hoped. This discovery of Freon-40 in places that must predate the origin of life can thus be seen as a disappointment. However, organohalogens may be significant components of the material from which planets form. This result underscores the challenge of finding molecules that could indicate the presence of life beyond Earth. Exoplanet research has gone beyond the point of finding planets – more than 3,000 exoplanets are now known – to looking for chemical markers that might indicate the potential presence of life. A vital step is determining which molecules could indicate life, but establishing reliable markers remains a tricky process. Freon-40 is also known as methyl chloride and chloromethane, and was detected around both the infant star system IRAS 16293-2422 , about 400 light-years away, and the famous comet 67P/Churyumov-Gerasimenko (67P/C-G). Organohalogens consist of halogens such as chlorine and fluorine, bonded with carbon and sometimes other elements. On Earth, methyl chloride is created by biological processes – in organisms ranging from humans to fungi – as well as by industrial processes such as the production of dyes and medical drugs. The discovery of organohalogens in the interstellar medium also tells the researchers something about the starting conditions for organic chemistry on planets. Such chemistry is an important step toward the origins of life. Organohalogens, the findings suggest, are likely to be a constituent of the so-called ‘primordial soup’ – both on the young Earth and on nascent rocky exoplanets. Holger Müller, a spectroscopist at the University of Cologne’s Institute of Physics I and a co-author of the study, says: ‘The identification of molecules in space usually relies on laboratory studies of these molecules.’ He maintains the Cologne Database for Molecular Spectroscopy, CDMS, an important repository of data to identify interstellar molecules. He helped to identify the compound’s spectral fingerprints, and thus to verify their occurrences in outer space.